ISLAMABAD;(APS) OCT 17,2018- Information Minister Fawad Chaudhry has said the government is ready to sit with the opposition parties to bring improvement in the NAB laws and the Accountability process. Speaking in the National Assembly today on the points raised earlier by Opposition Leader Shahbaz Sharif, he said we will welcome the opposition parties’ suggestions in this regard. He said we want to bring more transparency. 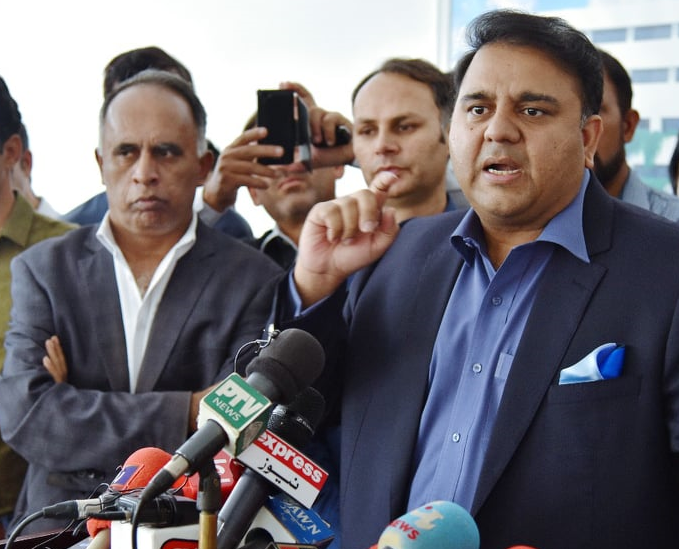 Fawad Chaudhry however, clarified that none of the cases registered against the Opposition Leader were initiated by the PTI government. He reminded that all the appointments in the NAB including that of its Chairman were made by previous government and Pakistan Peoples Party. The Information Minister said that the PTI government has set healthy democratic traditions and it is the first in the history that production order of an elected person on remand were issued. Taking the floor, PPP leader Khurshid Shah said the parliament is mother of all institutions and it can form committees to investigate important matters. He supported the demand of opposition leader Shahbaz Sharif for formation of committee to investigate the allegations levelled against him. Earlier, talking to newsmen outside the Parliament House, Information Minister categorically declared that an across the board accountability process will continue without any discrimination. He said government does not believe in political victimization but will bring to justice all those who plundered the national exchequer. He said any amount of hue and cry would not hinder the ongoing accountability process in the country. He said opposition parties should come out with concrete proposals to amend the accountability laws to ensure transparency in the process.